There is not any other dessert I can think of that combines both richness and lightness together at the same time as this one does! 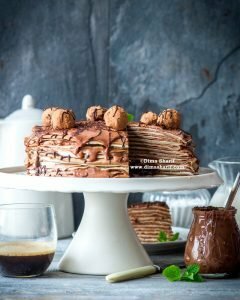 While the ganache and chocolate spread, along with the truffles on top and the drizzled chocolate all ooze chocolate and richness aided with the hazelnut flavour lent by the butter, the actual crepes are very light and airy that you forget they are in the company of such luxury! This dessert is absolutely decadent and is not by any means one to be had on skimping days!!! Or light days for that matter, because no matter who you are, what eating plan you follow… if you dare take a bite, you will be back for more and more and more! Use the recipe on this link to make the crepe batters and finish the crepes in prep for use here. Prepare the crepe batters and set aside until ready to make. Make the ganache and refrigerate half the quantity, keeping the other half standing at room temperature until ready to use. Make the chocolate spread and set aside. Make the crepes and allow to cool. Spread a little ganache over the cake stand and add the first crepe. Alternate the vanilla and chocolate crepes as you go, spreading the chocolate spread between the layers of crepes. Spread a whole vanilla crepe with hazelnut butter 3 times as you layer. (one hazelnut butter layer ever 1/3 quantity of crepes). Follow the hazelnut butter layer with a chocolate crepe layer and spread that with ganache. Repeat after each hazelnut butter layer. Spread the last layer with chocolate ganache then drizzle some melted dark chocolate on top. Refrigerate the layered crepe cake. Scoop with a melon baller from the refrigerated chocolate ganache and roll quickly into a ball. Quickly roll the ball in the sifted cocoa powder. Repeat until all have been rolled. Place a few truffles over the layered crepe cake along with a few mint leaves and refrigerate until ready to serve. Place the remaining truffles in a small bowl and refrigerate. Serve the cake cold with tea or coffee and place at least one extra chocolate truffle with every slice you serve. If you prefer an oozing chocolate experience, let the cake stand for 5 minutes at room temperature before serving!